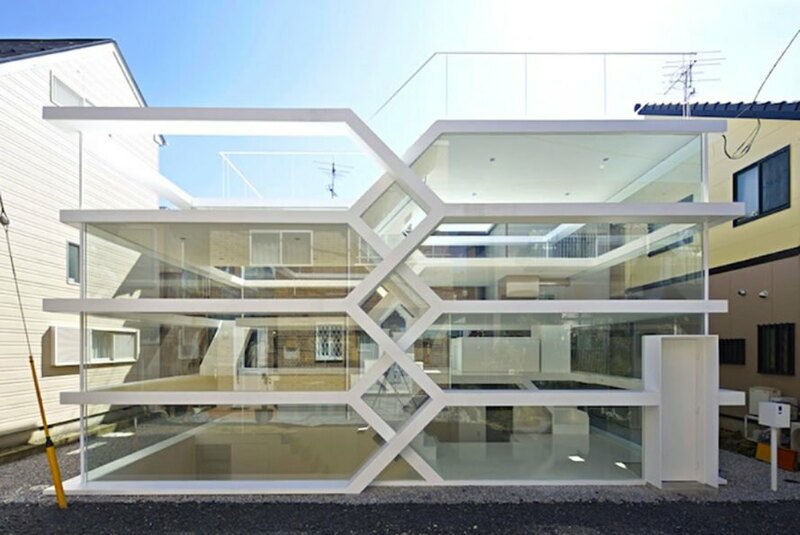 The generously glazed S-House design is a continuation of architect Yuusuke Karasawa’s interest in “complicated network space,” a term related to how technology, like the Internet, has changed society. Karasawa captures that complex relationship in the home’s two-story structure, which uses zigzagging staircases and split-levels to create a complex layered interior. Although all floors can be seen at once—there are no full wall partitions in the traditional sense—the rooms are not easily accessed from one side of the house to the other. The interior layout and weaving staircases are emphasized by the addition of thin, fluoropolymer-painted white steel plates added to the facade of the house. The interior is almost entirely finished in white-painted plaster board. The master bedroom and bathroom is partially located partially below ground and curtains have been installed for privacy. The S-House also contains an entrance hall, kitchen, living room, and guest room. An outdoor terrace lined with white ceramic tiles is located at the top of the building. The generously glazed S-House design is a continuation of architect Yuusuke Karasawa’s interest in “complicated network space,” a term related to how technology, like the Internet, has changed society. Karasawa captures that complex relationship in the home’s two-story structure, which uses zigzagging staircases and split-levels to create a complex layered interior. Although all floors can be seen at once—there are no full wall partitions in the traditional sense—the rooms are not easily accessed from one side of the house to the other. The master bedroom and bathroom is partially located partially below ground and curtains have been installed for privacy. The S-House also contains an entrance hall, kitchen, living room, and guest room. The bathroom in the S-House. Section view of the S-House. The interior is almost entirely finished in white-painted plaster board. An outdoor terrace lined with white ceramic tiles is located at the top of the building. 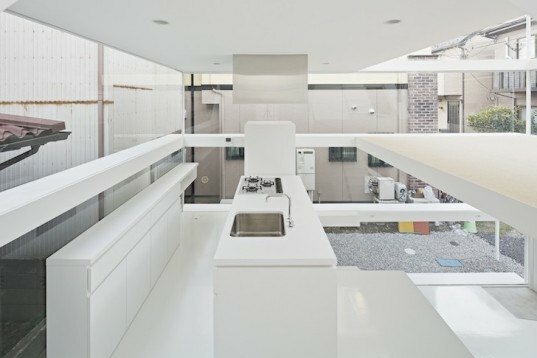 S-House by Yuusuke Karasawa Architects.